an art of sound in time that expresses ideas and emotions in significant forms through the elements of rhythm, melody, harmony, and color. In this unit, we well focus upon these aspects of music, as well as how different types of music makes us feel. 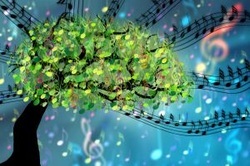 Music has the ability to affect not only how we feel, but how we respond as well. Have you ever wondered why hearing a certain song can trigger a variety of emotions or cause you to recall a particular memory? How the musical score used in movies can evoke particular feelings in the audience? During this unit we are going to embark on a journey through a musical web quest to help understand how human emotions are affected by music, while exploring different musical genres and pairing this with pictures and text to create a mood. For their final project, the students will have the opportunity to work in Garage band, Smart Notebook, Microsoft Word and i-Movie to create an e-card featuring a holiday of their choice. Stay tuned . . . more information will be added as we make our way through this unit!